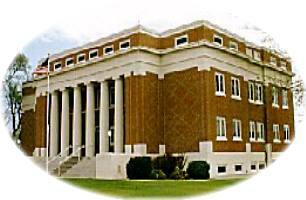 Meade Center had been started as a town in 1885 named as the center of Meade County after General George Gordon Meade. Its name was changed to Meade in 1889. The year was 1886, and the small Western Kansas town of Meade was enjoying "growing pains" as the railroads brought more activity to the area. All major cattle trails of the era touched the surrounding plains. Banks out-numbered mercantile stores. Saturday night dances and Sunday "sociables" provided something to look forward to, and later talk about. A handsome young woman named Eva Dalton arrived on the scene from the Coffeyville area. Later, Eva's brother, Emmett Dalton, attended her wedding and more brothers arrived soon after. In the years that followed the Dalton Gang was a phantom presence. Horses were stolen and trains were robbed. Speculation concerning Eva's guilt or innocence in connection with her brothers' activities made it impossible to remain in Meade. Further investigation led to the discovery of a rain wash covered with boards and dirt leading from a secret passage under the stairway in Eva's house directly to the barn some distance away. The Dalton Gang Hideout became legendary. Meade County has 13,956 acres of walk-in hunting.